Here is the tone stack from the Hiwatt CP103, better known as the amp created for The Who. The stack is also found in Sound City amplifiers like the SC-105. To simplify the mathematics, we'll make two important assumptions. First, we'll assume that the driving circuit has an output impedance of zero. For a low-impedance driver like a cathode follower, this is a highly-accurate assumption. The CP103's driving stage is a 12AX7 voltage amplifier with a 220k plate load resistor and a partially bypassed cathode resistor. Its output impedance is 49kΩ at treble frequencies and even higher for bass. Nevertheless this simplification will turn out to be good enough to create an accurate design. Second, we will assume that the tone stack output drives an infinite input impedance. 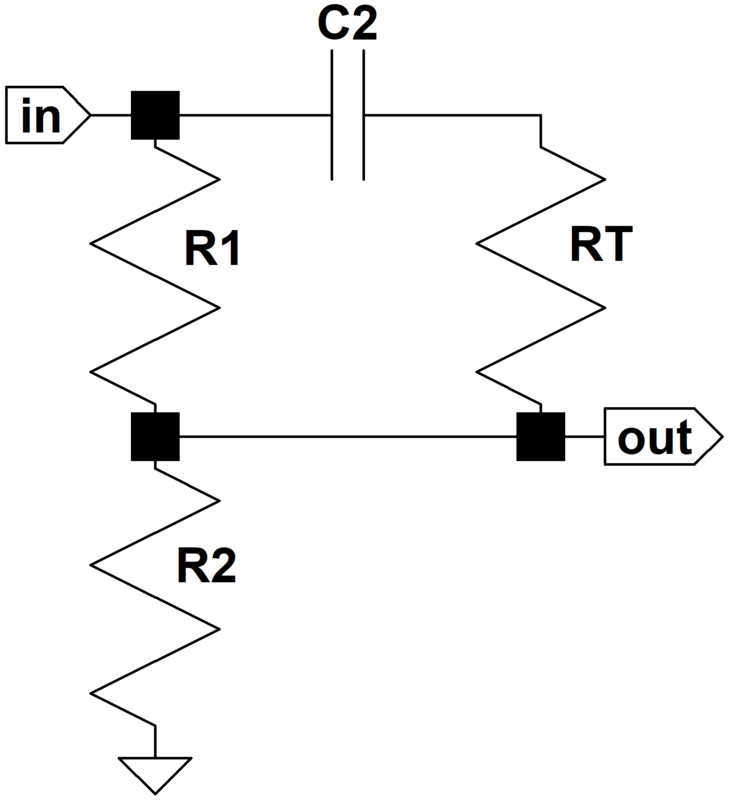 Tone stacks often drive a 1MΩ grid resistor. The Hiwatt uses a 250kΩ master volume control in this position, but we'll see that this simplification is also justified, because the results are very similar. These assumptions make it easier to turn our analysis around, so that we can calculate the required parts values based on a desired frequency response. Once these parts values are finalized we can test the results under real circuit conditions. Let's begin by setting the bass at maximum and the treble control at minimum. This shorts R2 and connects the output directly to the bottom of RT. C2 is smaller than C1 and dominates performance only at treble frequencies. 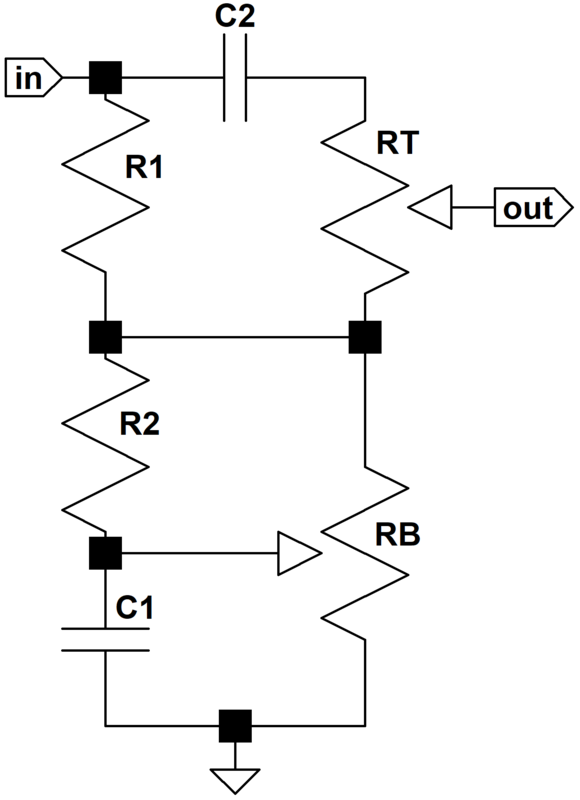 With the treble control at minimum it is in series with RT, which is larger than R1. For all practical purposes we can ignore C2 under these conditions. 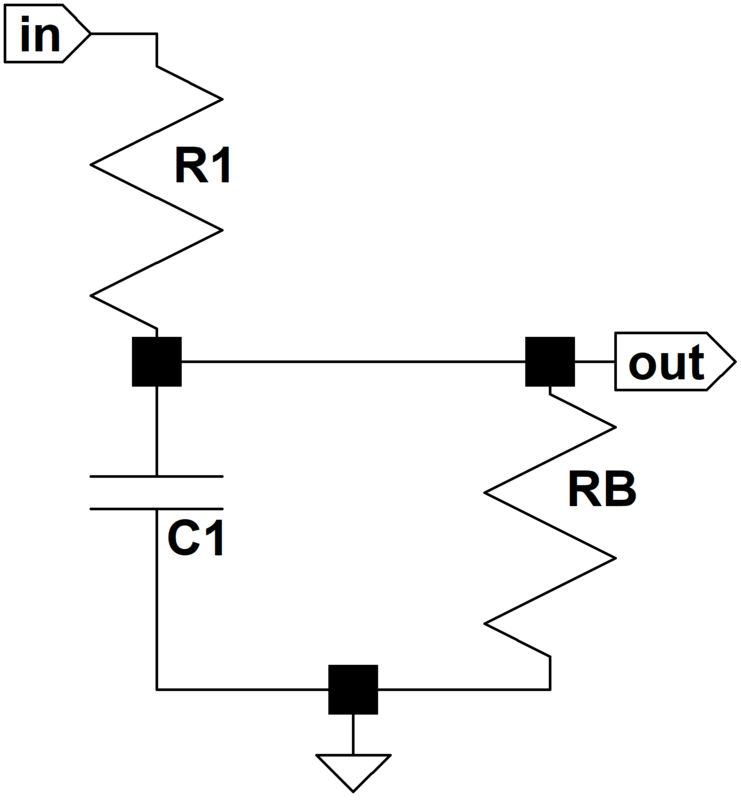 Because we're driving an assumed open circuit, there is no current through RT and by Ohm's Law there is no voltage across it. 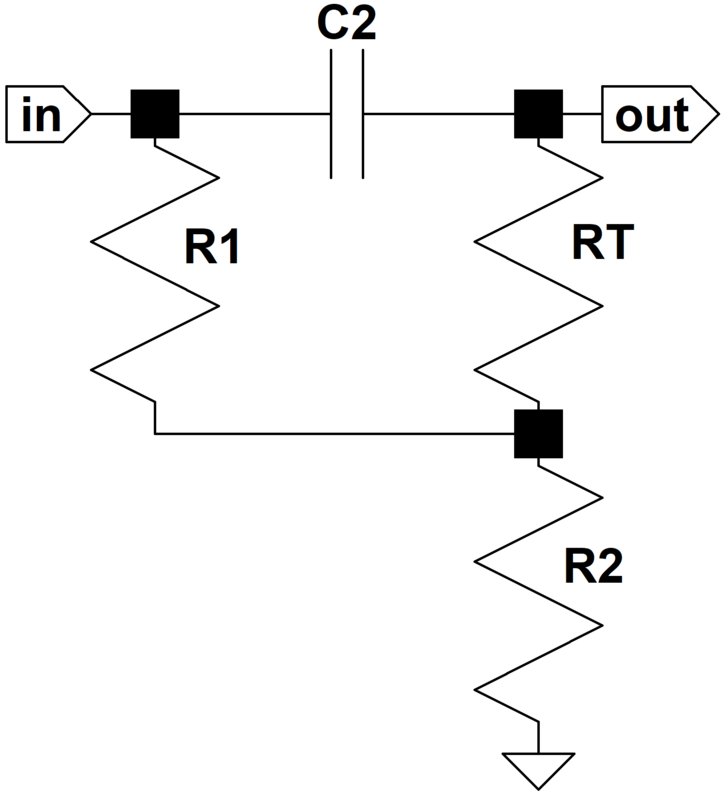 Thus we can treat it as a short circuit, giving us a classic voltage divider where Z1 = R1 and Z2 is equal to the impedance of C1 in parallel with the bass control. 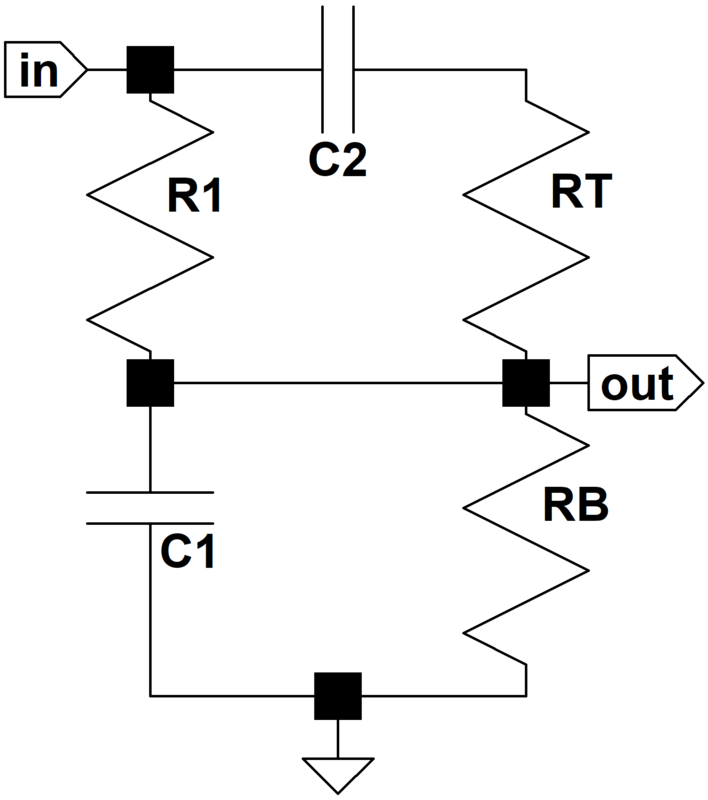 This makes sense, because C1 is open, making the circuit a simple voltage divider formed by R1 and RB. As the frequency goes to infinity the output goes to zero. This also makes sense, because C1 shorts the signal to ground. Above this frequency the response decreases at a rate of 6dB per octave (20dB per decade) until C2 begins to conduct. 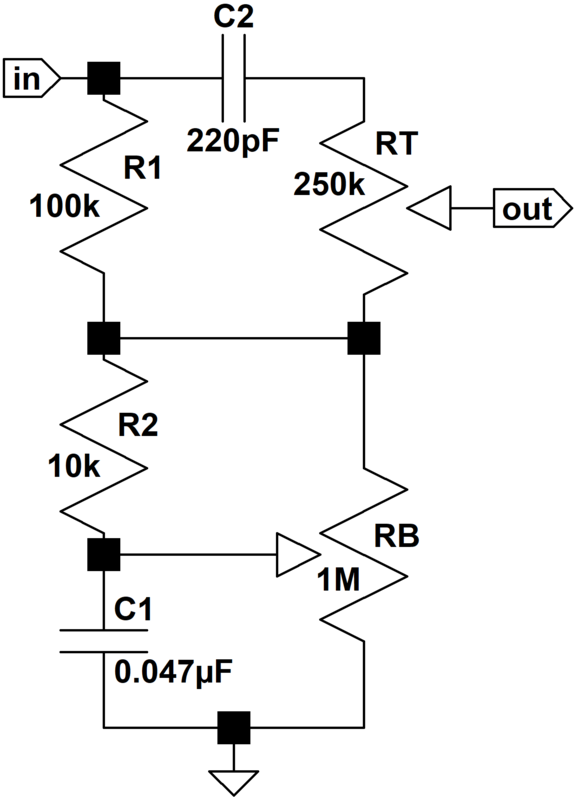 (As mentioned, however, C2 doesn't have much effect because of the 250kΩ resistance represented by RT. We'll clearly see this in simulation.) 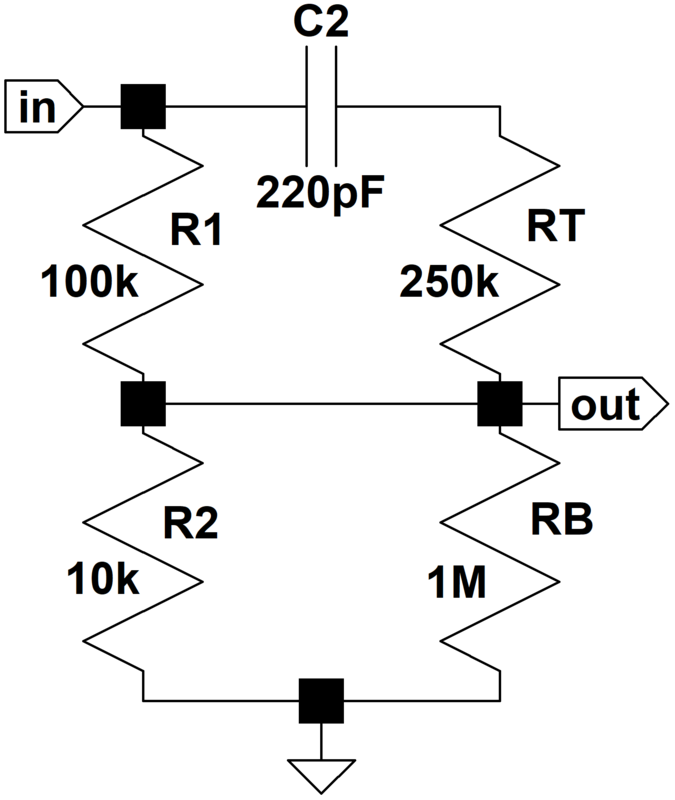 For the Hiwatt CP103 amplifier, where R1 = 100k, C1 = 0.047uF, and RB = 1MΩ, low-frequency gain is minus 0.8dB and the transition frequency is 37Hz. The approximate pole response and and overall gain are represented by the dotted line. The actual response, which includes the 3dB difference at the transition point, is the solid curve. Here is the response using Electronics Workbench Multisim®. In this case the plot assumes a driving circuit output impedance of zero and a driven circuit input impedance of infinity so that we can directly compare the results. (The horizontal axis is a log scale of frequency from 10Hz to 10kHz and the vertical scale is from -45dB to 0dB.) If you look very closely you can see a very slight upturn in response due to C2 conduction at treble. Otherwise the results are identical to what we obtained assuming the capacitor was an open circuit. Here is the response when we include CP103 conditions: a 49kΩ driving impedance and a 250kΩ load. We observe additional attenuation for very low frequencies. The actual response is a bit more exaggerated by the CP103's partially bypassed cathode resistor, but not significantly. For the lowest note of a guitar with standard tuning, 82Hz, the difference between assumed and actual conditions less than 1dB. The second represents the midrange-treble transition frequency, which for CP103 component values is 254Hz. The first represents a transition to zero attenuation at 2.8kHz. We see substantial bass cut and a transition through midrange to zero attenuation for treble. The results are almost the same, except for additional bass attenuation due to the greater-than-ideal driving impedance. At DC, when s = 0, the gain is that same as for a voltage divider formed by R1 and R2, which for the CP103 is -21dB. This makes sense because the capacitor is an open circuit, there is no current through R2, and thus no voltage drop across it. which, if we work the math, represents the same voltage divider but with R1 replaced by R1 in parallel with RT. Thus C2 is predictably acting as a short circuit. For the CP103 this is -18dB, representing treble boost of only 3dB compared to bass frequencies. Under real circuit conditions the response is nearly identical. The one combination we haven't examined yet is for the bass and treble controls at maximum. In this case both capacitors interact to create midrange attenuation, thereby creating the equivalent of bass and treble boost. We could compute this response directly by applying Kirchoff's Voltage Law over multiple loops, but having already looked at bass and treble boost in isolation, this is hardly necessary. The plot incorporates a driving circuit output impedance of 49k and a driven circuit input impedance of 250kΩ. Midrange scoop is centered around 316Hz. It has a bass transition frequency of 142Hz and a treble transition frequency of 2.5kHz. Let's modify the CP103 tone stack to use these transition frequencies. A rough approximation of the expected response (with bass and treble controls at maximum) can be seen by drawing two lines. The blue line below shows a modified CP103 bass response that starts at 142Hz, 0dB, and ends one decade higher (1.42kHz) at -20dB. This represents 20dB-per-decade attenuation that begins at 142Hz. Likewise the red line shows a treble-to-midrange attenuation of 20dB per decade that begins at 2.5kHz and ends at 250Hz. (Nothing really "ends" there - it's just a convenient reference point to give the line the correct slope.) From the intersection of the blue and red lines we observe midrange scoop centered around 600Hz. Let's determine the CP103 component values needed to produce this result. These two equations represent two constraints, and since there are many more parts values than constraints it appears we have a lot of freedom of choice. There are other factors to consider, however. The overall circuit impedance needs to be high enough not to bog down the driving circuit and low enough not to be bogged down by the stage it drives. We'll therefore keep the CP103's R1 value at 100k. Out of convenience, we'll also retain the CP103 tone control values of RB = 1MΩ and RT = 250kΩ. Here is the response using Electronics Workbench Multisim®. This plot assumes ideal conditions: zero source impedance and an infinite-impedance driven stage. These were the conditions we used to determine the parts values. (The horizontal axis is a log scale of frequency from 10Hz to 10kHz and the vertical scale is from -35dB to 0dB.) Here is the same plot using CP103 operating conditions: a driving circuit output impedance of 49kΩ and a driven circuit consisting of a 250kΩ volume control.